Casein Kinase 2 (CK2) Inhibitors: Emerging Anticancer Therapeutic Agents? While it is pleasing to see the continual upsurge in scientific articles describing research on drugs for cancer therapy, this increase in the literature makes it everharder to keep up, even with selected topics in the field. Thus it is very good to see this e-Book venture by Bentham Science Publishers, containing selected, author-updated papers originally published in Anti-Cancer Agents in Medicinal Chemistry during 2008-2010. A particular virtue of this approach is that it obtains additional value from all the effort that is initially put into writing a review, by keeping it up-to-date and thus more useful. The present Volume 1 contains reviews of many of the classes of drugs of contemporary interest for cancer therapy, and offers a new way of keeping up with a field of interest, or being rapidly introduced to a new field. I congratulate Michelle Prudhomme, Editor-in- Chief of Anti-Cancer Agents in Medicinal Chemistry, for this interesting new venture, which I commend to you. 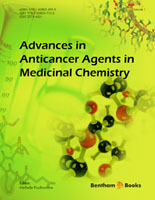 This is the first volume of an exciting eBook series entitled Advances in Anti- Cancer Agents in Medicinal Chemistry which will comprise a selection of the best articles published in the Bentham Science Journal Anti-Cancer Agents in Medicinal Chemistry. These articles will be updated. In Volume 1 and 2, updated articles published during 2008-2010 are presented. Volume 1 gathers chapters devoted to small molecule inhibitors of various proteins involved in cancer development. The first review by Giorgio Cozza and Stefano Moro is entitled “Casein kinase 2 (CK2) inhibitors: emerging anticancer therapeutic agents”. This chapter presents this complex and multifunctional protein which plays a key role in several physiological and pathological processes. Its structure, its biological role and its implication in various diseases are described as well as the different families of inhibitors which could permit a better understanding of the cellular functions of CK2. The second chapter by Ian Collins is devoted to Protein Kinase B (PKB) inhibitors and to the discovery of novel ATP-competitive PKB inhibitor scaffolds, as well as further exploration of the potential of peptide substrate-based inhibitors. Dysregulation of the mammalian target of rapamycin (mTOR) pathway is frequently observed in various human cancers. The third chapter by H. Zhou and S. Huang reports the advances in the search for mTOR inhibitors as anticancer agents, rapalogs, ATP-competitive inhibitors as well as natural products. The review of Samir. Messaoudi et al. is focused on recent advances in 90-kDa chaperone protein (Hsp90) inhibitors. Hsp90 is an emerging therapeutic target of interest for the treatment of cancer. Inhibition of Hsp90 has been shown to be effective in killing cancer cells that have developed resistance to targeted therapies such as kinase inhibitors. The phenomenon of multidrug resistance (MDR) reflects the fact that resistance occurs against a broad diversity of drugs due to an altered membrane transport caused by increased efflux rates of the cytostatically active drugs. P-glycoprotein (P-gp) belongs to the family of transport proteins. It is overexpressed in cancer tissues. A huge interest has been devoted to the development of P-gp inhibitors. This chapter by Andreas Hilgeroth et al. reviews recent advances in P-gp inhibitor development, focusing on structure-activity relationships in the different compound classes. The kinesin spindle protein (KSP) plays a key role during mitosis. Since mitotic kinesins are absent from post-mitotic neurons, small molecule inhibitors targeting these enzymes will not cause the neuropathic side effects of the antitubulins. Accordingly, KSP is an attractive target for the development of anticancer drugs. Two Chapters are devoted to KSP inhibitors. Yingjie Zhang and Wenfang Xu summarized the various categories of KSP inhibitors whereas the review of C.D. Cox and R.M. Garbaccio described the efforts carried out at Merck in the search for allosteric KSP inhibitors leading to the discovery of MK-0731 and analogs. Many different types of human tumors express highly elevated levels of Cyclooxygenase 2 (COX-2), leading to the idea that increased expression of this enzyme might contribute to the carcinogenic process. Consequently, COX-2 has been considered as an attractive target for anticancer therapy. The review by A.H. Schönthal reports the recent advances in the search of COX-2 inhibitors. Celecoxib and analogs are especially developed because of their dual pharmacological potencies, inhibition of COX-2 and induction of apoptosis. They represent a novel class of promising cancer therapeutic agents. Histone deacetylase enzymes (HDACs) are major regulators of cellular protein acetylation, especially of histone protein. Acetylation levels of histone protein are controlled by the opposing activities of histone acetyl transferase (HAT) and HDAC enzymes. Hypoacetylated histone protein has been associated with precancerous or malignant states. The chapter by Charles M. Marson is focused on the different classes of histone deacetylase inhibitors, their structure, their function and their potency to kill cancer cells. The role of topoisomerase I inhibitors in the treatment of gliomas has expanded in recent years, especially with respect to combination therapy. Topoisomerase I (TOP1) is an enzyme critical for DNA replication and cell-cycle progression. The most studied TOP1 inhibitors are topotecan and irinitecan, derivatives of the natural compound camptothecin. Lynn G. Feun et al. reviewed the recent results in the treatment of primary CNS malignancies using TOP1 inhibitors alone or in combination with other agents.